Standing out in the open, how strong is the breeze? 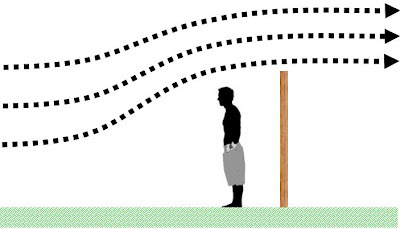 Standing behind a solid fence, how strong is the breeze? Standing in front of a solid fence, how strong is the breeze? If you answered 10, very little, and 10, then there's some learning to do. The answers are 10, very little, and very little. A lot of people get the last one wrong because they don't understand how the wind goes around an object. I'm sure there are scientific explanations about how low pressure area avoids a higher pressure, but my simple way of describing this is that the wind "knows" what's up ahead. So substitute the word "fence" with a "crowded starting line." The boats act like a fence (and are even called a picket fence) and some of the breeze goes over them. This is yet another reason why it really pays to get a good start where your bow punches out - you're literally sailing in more wind. But there's more! 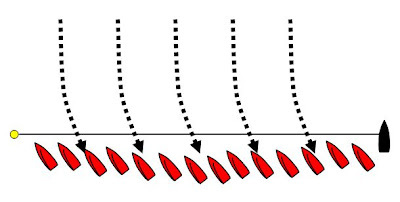 Looking from above, the wind also "knows" that the fleet will bend the wind, so this bending starts in front of the fleet. 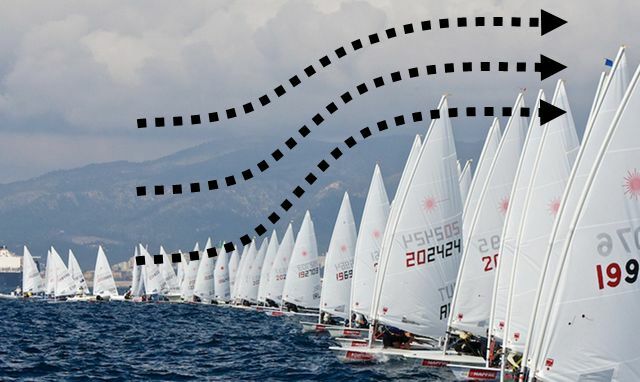 The fleet is actually sailing on a slight knock which means that if you can, it often pays to tack twice if you want to continue going left in better air. For the same reason, getting a bad start, having to tack to duck some boats is not as bad as it might seem because you're on a temporary lift and can get a little more speed before you round up. 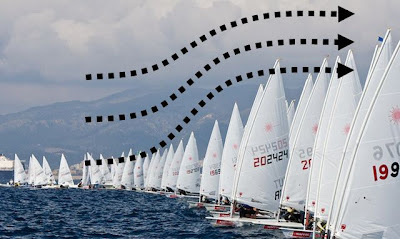 Things get really interesting if there is a sag in the line, as we often see with starts under a black flag. A boat sailing on port in the sag will actually be sailing in more wind and on a lift when the gun goes! I've often thought of trying this in a big fleet but never had the courage to try this. So in the second race at the Midwinter's, when Andy Roy was on port coming straight at me to windward of the fleet, I didn't say to myself, "What the hell is he doing?" I said, "Beautiful, wish I'd tried that!" As it turned out, going left paid and Andy went the wrong way. But it was an absolutely awesome start!! Wow, that took guts - and a very good sense of where the line is. Exactly. It works best with a black flag when you know the boats will hold back. 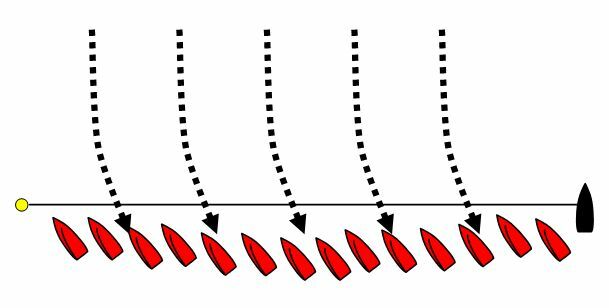 You really cannot tell where the line is, so the trick is sail on a reach on port with your boom in, just above the boats coming at you on starboard. It would make a great video if you could get the look on people's faces! 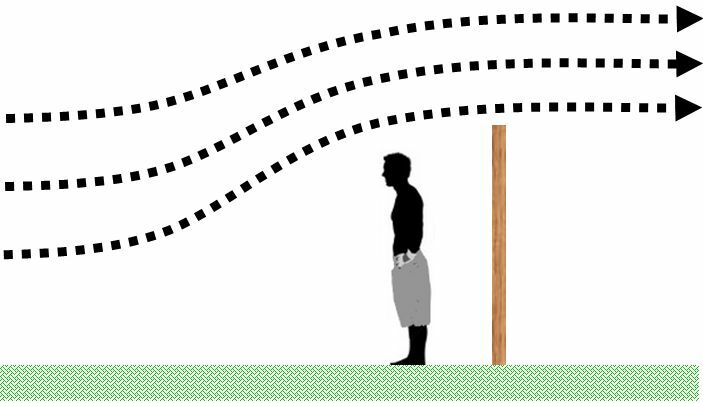 Just one thing, in your second last graphic, wouldn't the wind be bending to the right at the port end? And just one person pulling the trigger early can ruin the start! But the sag is usually there with a big fleet under a black flag. My diagram needs a little more explaining. The bottom of the dotted lines bend to the right and are a knock (normally "to the right" means a lift, but the diagram is where the wind is going to and not where the wind is coming from). The boat at the pin might actually be on a lift as the wind tries to go around it and the back of the fleet. If this is the case, then it's another reason to be at the pin!